Last week if you had asked me what a dandelion crayon was I might have looked at you like you were nuts. Yet today I bought two 24 packs of Crayola crayons for dandelion crayons. Why this sudden attachment? 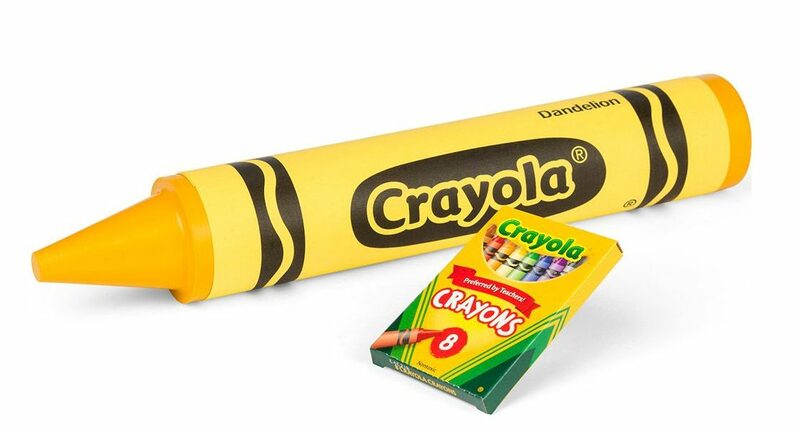 Well, Crayola announced a few days ago they are discontinuing the dandelion crayon. This actually makes a lot of sense for them since they already have yellow, apricot, white and red orange, which would all work for coloring dandelions. I mean how often do you really need a mustard yellow crayon? So, why did this news make me a little sad and send me out to buy crayon boxes? I’m honestly not exactly sure. I think part of it is a resistance to change. Sometimes it feels like everything is changing all around me. Of course, we have important stuff happening in politics but then stupid stuff like Batman killing in movies and Superman getting murdered. Why does everything have to change? I just saw Beauty and the Beast remade and changed and a million other remakes are coming. Now they are taking away the dandelion crayon. I suppose there was a side of me that wanted to hold on to something that is still the way it was when I was little. The 24 pack had dandelion crayons when I was drawing as a little girl and now it wouldn’t. 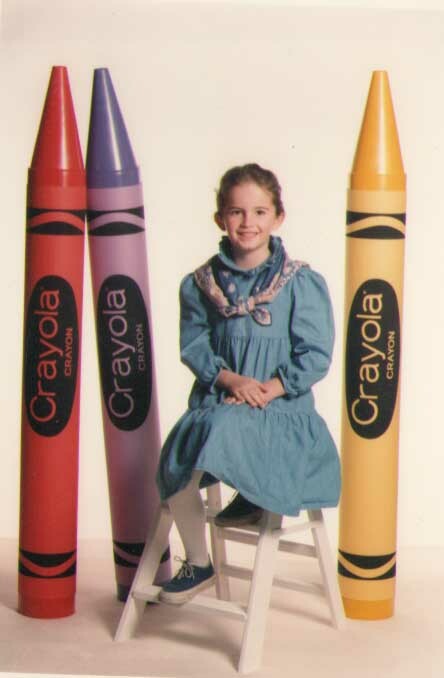 When I was 8 or 9 there was a special photograph you could have taken by these big giant crayons. I wanted my picture by them so badly! There I am smiling and happy and what am I next to? Why it’s a dandelion crayon. In a few weeks that will be gone. I’m getting more towards 40 every day but I suppose sometimes I miss that smiling girl who didn’t have to worry about all these hard things. I just wanted to get my photo taken by a dandelion crayon. So yes today I bought dandelion crayons and some coloring books. I plan on coloring to my little hearts content and using as much dandelion as I can. So my brother spoke at TedxPortland. If you aren’t familiar with Ted Talks they are a series of talks by experts on a variety of topics. A lot of them have a motivational speaker type of feel but not all of them. In my brother’s case he was asked because he is the founder of Poler LLC which is a popular clothing and outdoors brand based in Portland. He speaks about using technology to expand your life not minimize it, to help you get out into nature instead of isolating yourself. It is a good reminder to me as someone who does spend a lot of time with media of different kinds to get outside and share that adventure with others. I particularly like how he used the example of water as swimming in lakes and rivers is such a powerful experience for me. This weekend I am going to Bear Lake for a race and since I haven’t been feeling that well I was wondering if it was going to be worth it. My race is probably not going to be the greatest but listening to my brothers words made me glad I am spending some time in the beautiful water. Who cares about the race! What do you guys think about what he has to say? Do you find yourself phrozen to your mobile devices? What do you like to do to get connected with nature? Any reader to this blog knows I am an extrovert. I think anyone who shares their life online is pretty extroverted but in some ways I am jealous of my introverted friends and family (who occasionally make me crazy with their introverted ways!). It would be so nice not be expected to lead all the time. Extroverts are often turned to for leadership and most of the time it is ok because we are the most outspoken about how we want things done. But sometimes it can be exhausting and I just want to be a follower. Perfect example is in my new Midsingles committee. There are a 11 stakes involved and who ended up leading discussions- me. I was up front trying to corral everyone’s thoughts and write them on the board, trying to make the meeting run as smoothly as possible and we only went over by 10 minutes. There was a side of me that was exhausted but a little exhilarated after because it was a challenge leading the meeting. There was another side who wished I could have just sat in a corner and written down what I had to do and be done with it. But then who would lead the meeting? In this case I don’t know if there was anyone who could have led the meeting and I was happy to do it but I do envy how little introverts have to lead others. It’s hard being in charge! 2. 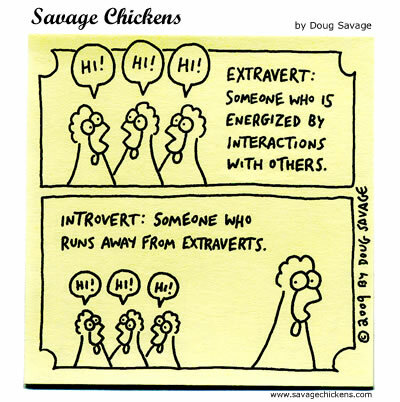 I also envy introverts lack of a need for social interactions. If I am not actively meeting new people, making friends, spending time with friends, I get depressed. My introverted friends can have an evening out with the hubby or a friend once a month and be fine. The older I get the harder it is to get together with friends and sometimes I wish I could turn the part of my brain which needs it off and be happy regardless. That said, I do a great many things alone and am comfortable with it but it is never my preference; whereas, introverts may often prefer to be alone. 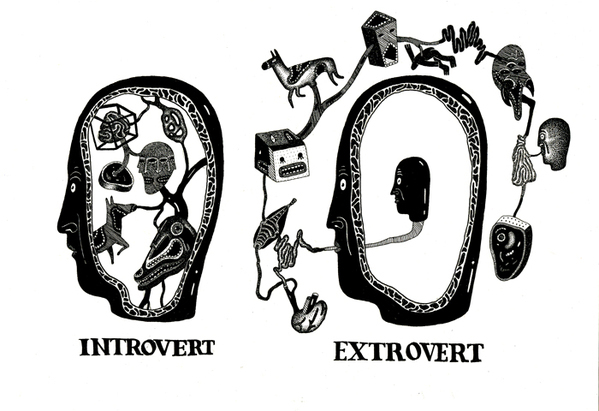 On the same breath I think sometimes introverts have different relationships than extroverts. Because they are usually quiet and more reserved it takes more effort to get to know them; thereby, making the friendships they do achieve very meaningful and important. My friends mean everything to me but as an extrovert I am extremely easy to get to know. I literally have no secrets with the world and I think that is a good thing; however, it can lead to me investing more in friendships than others and being disappointed when people flake or aren’t as serious about the friendship as I am. 4. I’m envious of the way introverts learn and study. There are all kinds of stereotypes which go along with being an introvert or extrovert, but one of the most prevailing is that introverts are more academic and smarter than extroverts. There is probably some truth to this notion because introverts are more likely to read and do other solitary academic activities. The challenge can be as an extrovert I need to express my thoughts on subjects in order for me to finish out my thinking. This can be seen as combative or challenging to introverts who don’t want to debate topics especially in a group. Groups can be frustrating because I am always asked to lead but it is the best way for me to actually learn most topics. I can read something by myself 4 or 5 times and not get it but then have a discussion with a friend and pick up right away. I guess I’m envious of the brain which doesn’t need the social component to learn if that makes sense. Because introverts are typically more soft-spoken and quiet (at least in groups) they tend to be good listeners. Sometimes I can get frustrated at them not expressing their opinions or sharing their thoughts with me. It can feel closed off, even dishonest, when they are probably listening, pondering and formulating opinions by themselves. While I may be formulating my opinion while they are talking, waiting to express it, introverts are usually listening to what I am saying and then communicating carefully what they feel and think. There’s something great about that which I have worked on over the years but will never be my top attribute. Listening takes focus for me and I have learned to bite my tongue and let everyone share. But it’s hard for me so I envy those who just want to listen. 6. I envy an introverts peacemaking skills. Jesus said ‘the meek shall inherit the earth”. Why does He speak so highly of the meek introverts? I think it is their peacekeeping skills that help calm down us extroverts. I get passionate and excited about a variety of topics and it is my introverted friends who pull me down from the ledge and get me to see both sides, even when I really don’t want too. Sometimes introverts can frustrate me because they seem to not have opinions on anything. It’s so hard to know what they like or dislike, or where they stand on key issues. However, often it is the introverts who see the middle ground, the compromise, and I am able to let go of my pride and concede at least a few points. In the end we are who we are and we can’t change that. We can work with it and tweak it but our core personality is always with us. We all have different gifts and can learn from each other. All of these introverted traits I try to apply as much as I can in my life without it stifling who I am. And I am sure introverts have a list of reasons they are jealous of extroverts. Thankfully we can all learn from each other, be patient and get along no matter what ‘vert’ we are.